Some days trying to find REAL vintage stuff is like trying to find a needle in a haystack thanks to tons of faux vintage items flooding the market. Some of you may be familiar with Alibaba. (Not a fan!) They have a category called “Antique Imitation Crafts” where you’ll find everything from “antique” Russian military medals to Bohemian crystal vases to German first aid kits. All this NEW stuff is being made (mostly in China) to look like the old stuff. AARGH! So yesterday was a bit serendipitous. I was at a library book sale and I found a few books for myself, one for a gift and a couple to resell. I was pretty happy with my purchases, but then I am always happy when I buy books…they are a tiny weakness of mine! I paid and left the building but outside they had a few tables set up with donated bric-a-brac. I always look this stuff over (naturally) but rarely find anything…until yesterday. 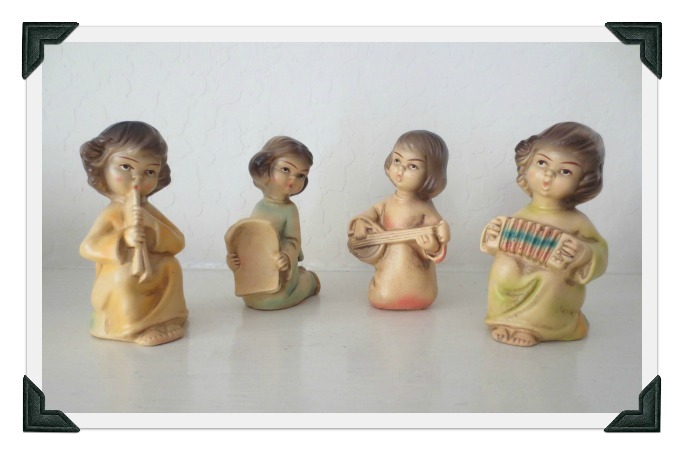 I found four little vintage chalkware angels, made in Japan, likely circa 1950s. They were in super condition and modestly priced. I felt like the clouds had parted! I said a silent, “Thank you God! !” I honestly did. These look like something my grandmother would have had on her living room mantel and that makes me smile. She’s been gone for 15 years now and I still miss her like crazy (a few tears now). My gram was a joyful, generous, fun-loving woman. She leaned towards kitschy stuff. She actually did paint-by-number pictures which she hung on her walls. She would have loved these angels! So I’m a bit weepy and nostalgic (funny how little tchotchkes can evoke such strong emotion and memories) but happy. Here’s hoping all your hunting makes you happy! so cute! and just the right season! can’t imagine that someone won’t snap that up!!! Yes, it is a hazard. I’m rather hoping they don’t sell right away! !